Amado behind the bar at Cava 22 in the Mission District of San Francisco. Not too long ago a “tequila lounge” opened a few blocks away. We walked by with peaked curiosity as they were preparing to open, our faces plastered against the windows, trying to spy their tequila collection. Finally, Cava 22 opened its doors and we rushed to check it out. First, Cava 22 isn’t really a lounge. It’s more of a large Mexican-themed restaurant with a tequila bar. We saddled up to the bar and assessed the collection. They had maybe 25 different brands, but none we hadn’t tried before. Bummer. But still we ordered a couple shots and asked for their sangrita. We love sangrita, especially if it’s spicy and a bit chunky, like they make it at the San Angel Inn in Mexico City (more on this to come.) But as soon as the bartender poured our shots of sangrita, I knew it wouldn’t be quite what we wanted. It was orange and watery. 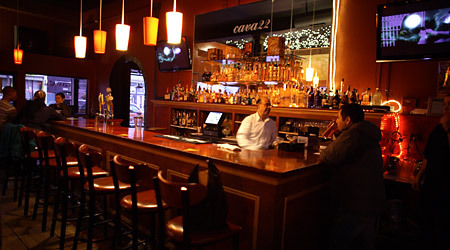 Well, a few nights ago we decide to go back to Cava 22 and give it another shot. We had seen the place try to make some changes over the last few months. They added a live mariachi band on the weekends (We LOVE mariachi! More later …) and we had heard that they picked up Amado, a bartender from a notorious Mexican restaurant in the Mission that shutdown. Amado pours up a healthy shot of Clase Azul Reposado, which Grover consumed, along with a shot of Sangrita. The restaurant and bar looked the same, and we didn’t see any new bottles, but still we ordered a couple drinks from Amado. He was friendly and knowledgeable and still pours a mean margarita, with only homemade sweet and sour mix. Grover got a shot of Clase Azul Añejo and asked for the sangrita. This time when the jug came up over the counter, it looked like a winner. It wasn’t “chunky” sangrita but it was a great balance of orange versus tomato juice, with just enough spice. Quickly, we plied Amado for the recipe. “Oh, tomato juice, Clamato, lime juice, orange juice, Tabasco, sugar, salt, pepper and horseradish,” he said. In the end, we determined that Cava 22 had made some improvements. The sangrita was strong, and the shot prices weren’t bad, compared to other places. 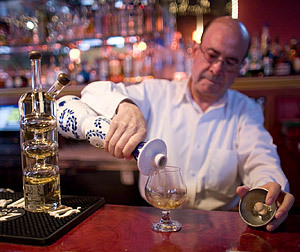 The Clase Azul was $13 a shot – a smooth, rich tequila with mad legs. So, if you haven’t tried Cava 22 a while ago, give it another shot. The drinks and food are good, the bartender is great, and who can be down when faced with a 10-piece mariachi band!? Great choice with the Clase Azul Añejo. We buy it when we have a chance. It isn’t the most floral or in-your-face añejo, but it is one of the ones we choose to have in our house. Has anyone tried Paqui? It’s a great new tequila that you must try – authentic and good tasting!!!! ……so think twice when u go to Cava 22, you are probably not drinking real tequila!!!!! That Clase Azul in the picture is the reposado. The anejo is in a a different bottle and is relatively new. Good catch! I just made the edit. Gracias.